When my daughter, Dana moved to Chicago she needed someone to drive her Toyota Corolla there from southern California. That road trip had my name all over it, so I happily volunteered. I kept a journal of my thoughts and observations along the way – here it is. It’s early, it’s dark, I’m invigorated by my planned road trip across two-thirds of America as I shower and get dressed. Did I leave the shower on? No, I look outside, it’s raining. It will not dampen my enthusiasm. I set out. Where’s the windshield wiper lever? More importantly where’s some coffee? Gosh, these Corollas are small. I fumble to find the cruise control in the dark, unsuccessfully. OK, I’m serious now, what happened to the Starbucks on every corner? Discover that Corollas don’t have cruise control! Limited music on the radio at this time of the morning. Didn’t realize we had so many Spanish-speaking stations – Mariachis at 5:00 a.m.? My gosh what are they so happy about at this time of day? Got coffee and finally out on the open road, sun starting to peek over the mountains. I’m hungry. Find an ‘Open 24 Hours’ truck stop. Wishing I still had that ‘TruckMasters Graduate’ ball cap as I feel like I’m not really fitting in here with my Bermuda shorts and Tommy Bahama shirt. I sit at the counter and order my coffee black, like the rest of the truckers – I’ll put some cream and sugar in it when I’m back in the car. I listen to the truckers’ stories and am reminded that I’m happy I have all my teeth. Back on the road. Soon the smell of rural American comes wafting through the car. I see horses and cows and acres of farmland. I see a little town ahead and slow down to read the sign . . . ‘Norco’. I’ve traveled nine miles. I’m thinking this could be a very long trip. It requires significant will power to drive past Vegas; I didn’t even know there was a ‘past Vegas’ until now. But on through to St. George, and after 700 miles, pull into Grand Junction, CO, for the night. While it is a junction of sorts, I didn’t really find it all that grand. The next morning’s drive was a ‘religious experience’ for me. There are few, if any, more scenic stretches of road in America than the one from Grand Junction, through the Rockies to Denver. The Colorado River has carved the most beautiful path through the mountains, and man has tunneled, cantilevered and laid his road next to the river. It makes one of the most beautiful blends of nature and man’s work that I’ve seen. I drove this road in the early morning hours, just as the sun reached the rim of the Rockies, providing a soft light to the freshly fallen snow. It was a quiet, cold (7 degrees at its coldest), breath-taking experience. I put in a John Denver CD, but decided that no sound was the best sound. The winter panoramas were purely magnificent. I pass the town of Rifle, the turn off for Aspen, Vail. I stopped to take ‘communion’ (a cup of coffee and a doughnut) in the village of Eagle. I parked the car, got out and just looked at the beautiful winter scape around me and listened to the quiet. The cold air fills my lungs and while it was unbelievably invigorating it was also damn cold. Back in the car and back on the road. I remind myself to tell anyone that has the opportunity to make this drive, particularly on a clear winter’s day, to do it. As I emerge from the Rockies the city of Denver unfolds below me. Eight months of the year I live in Paradise, otherwise known as Scottsdale, Arizona. Contrary to popular belief, it does get cold here in the winter – we’ve had a freak snowfall most every year – but generally we have sunny days and 70 degree temperatures. It’s what causes some of my jerkier acquaintances to call home to Minnesota every January and taunt their friends who are digging out from an ice storm. But all that is about to change. This past weekend we had our first 100 degree temperature of the year. That’s right – it’s frigging APRIL and we hit the century mark already. Although it will cool down a bit this week, the fact that we’ve had a 100 degree day means only one thing: we are once again facing hell on Earth. Literally. The average temperature here in July and August is 105. That would almost be bearable except that the average low is 75. So it never cools off. We are God’s warming drawer for four months of the year. I know that the conventional wisdom is that it’s a dry heat, but then again, so is my microwave oven and you won’t see me living in that. In the 14 years we’ve lived here I’ve never become used to this “upside down” schedule. My whole life I was conditioned to love summer – school was out, we looked forward to time at Tahoe, and we had lots of beer parties. Now summer is something to be dreaded. Somehow that still seems unnatural to me. Our strategy since I retired ten years ago is to escape out of here each summer. We have tried all sorts of combinations for our summer road trips – renting for a month, staying in hotels for a week or two, mooching off some of our friends who have mountain homes. Two years ago when our house was being remodeled we rented a condo in Sun Valley, Idaho for three months. Ironically, that was our worst summer. I have to admit, as nice as it was to get away for the whole summer, I really missed my “stuff” at home. So once again this summer we will be in and out of Arizona, traveling to California’s central coast, the Bay Area and up to Sun Valley. That leaves a lot of time to sit at home in the air conditioning and get stuff done. I’ve already started to compose my list of “summer projects”; really fun stuff like cleaning and organizing drawers, saving computer files to a hard disk, and alphabetizing the spice rack. But I also have a potential blockbuster to keep me occupied. When I did our family history last year I traced it back to medieval England, and there is some possibility that one of our lines goes back to the Irish kings. If true, that would go a long way towards explaining Bob’s propensity to enter every Irish pub he sees. We also might be related to King Henry II and Eleanor of Aquitaine, in which case I think we are 16,346 in line to the British throne. You’d think that should have warranted an invitation to the Royal Wedding last year. So, as those of you in other states get ready for BBQ’s, planting a garden or just chilling at the beach, I will be putting the cardamom between the caraway seeds and the cayenne pepper. And, maybe, getting fitted for my tiara. I love Oregon, but as a Californian I always go there in disguise; not the glasses, big nose and mustache kind, but rather with an affected Canadian accent, which ends up sounding more like a drunk Norwegian with a lisp. Why the disguise? I’ve found that it’s never a good idea to tell people in Oregon that you’re from California. The reason dates back to the real estate boom of the ‘70s when California home prices were very affordable and were attracting people from all over the country . . . the world. Californians, wanting to get away from this sudden in migration, decided that the ‘promised land’ had moved across the border to Oregon, so they started moving north . . . in droves. Oregonians, fearing that these new California immigrants would turn Oregon into another California, were not the least bit pleased with the influx of ‘flakes from the land of fruits and nuts’. While there was some question as to whether signs ever really existed at the California-Oregon border that read, ‘Welcome to Oregon. Now go home!’, Oregon governor at the time, Tom McCall, did set the tone with this quote to a CBS news reporter, “Come visit us again and again. This is a State of excitement. But for heaven’s sake, don’t come here to live”. But Californians still came, and to this day most things that smack of progress in Oregon are blamed on those who have ‘Californicated’ the state. So it was with mixed emotions that I went to Sunriver, Oregon on a recent business trip – anxious to see this beautiful part of the country for the first time, but concerned that there may still be a bounty on California natives loitering in these pristine environs; especially if I was going to enjoy a cigar while I was there. I thought rules for smoking in California were stringent, if you want to smoke in Oregon, you have to go to the Southeast corner of the state and step into Nevada. If you’re going to continue to smoke, Oregonians would prefer that you just stay there. I left the cigars at home. Prior to my trip I decided to look up a little history of Sunriver. The short version is that it was built by the Army as a training camp during WWII and then developed as a resort in 1968; I guess that’s the long version as well. The developer picked the name, so the brochure says, “to reflect the most characteristic features of the area”. Perhaps I came at a different time of year than the developers, but it was only on the last day of my visit that the sun came out and I caught a glimpse of the river. Had it been up to me to name the place, I probably would have called it something like Overcastandcold – of the four days I was there in mid-April, it rained once and snowed twice! I discovered that Oregonians have never shown much imagination when it comes to naming their cities, to wit: Drain, Sinks, Cake, Bakeoven, Wagontire, Lookingglass and Noon. There is also the self-deprecating town of Nimrod and one left over from their hippy days, Zig Zag. When they ran out of domestic objects as names they started just copying other US city – Cleveland, Denver, Kansas City, Detroit, Phoenix, Pittsburgh and Nashville are all cities in Oregon. To add an international flavor, they have cities named Glasgow, Lebanon, Little Switzerland, Paris, Rome and Damascus to name a few. I will say that the one sunny day I did have in Sunriver was spectacular, Mt. Bachelor shown as a snow-capped peak set against a deep blue sky, was awe-inspiring (see picture). ‘The Three Sisters’ peaks of the Cascades couldn’t have been more beautiful; the closest town: Sisters. I know that I breathed air in Sunriver that no one has ever breathed before. Oregonians are excellent stewards of the nature around them and I love that. 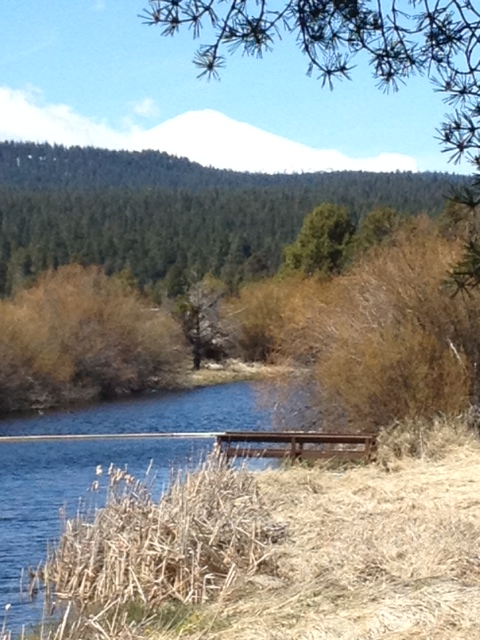 It was ultimately a joy to fully understand and appreciate how Sunriver got its name. Aloha, not a Hawaiian salutation, just another Oregon city. I love history – both generally and specifically as it relates to our family. Last year when I was studying some of the Sparrow history I was fascinated to learn that our grandparents were married the same week that the RMS Titanic sunk. In other words, that ill-fated ship and the Sparrows are commemorating a 100th anniversary this week. Of course, our grandparents have been dead for decades. But our family celebrates everything without much provocation. All the hoopla around the Titanic anniversary, including the re-release of the movie by the same name, has made me wonder what our grandparents thought about the disaster, or if it in any way affected their honeymoon. I suspect that I’m not alone in wishing that I had asked my parents and grandparents more questions before they died. Typical things mostly – what attracted them to one another, what their first job was, what mom was thinking when she chose that wedding dress, or, in this case, how did a major catastrophe affect their lives. I suspect that in my grandparent’s case, it affected them very little. Theirs was something of a scandalous marriage at the time so they had their own personal ice floes to navigate (and, yes, I’ll write about that in a future blog). Something that happened thousands of miles away to strangers would have been interesting, but not necessarily all-consuming. I suspect that they read about the Titanic in the newspaper over breakfast and then said something like, “Please pass the Devonshire cream”. Contrast that to what might happen if the Titanic sank today. One can only imagine the news coverage: helicopters flying over the site, news anchors broadcasting from both Southampton and New York, and inevitably Geraldo Rivera would be clinging to an ice berg, wind whistling through his hair, looking for lost treasures. We would be inundated with “expert” analysis and live interviews with people who had a third cousin once removed who went to grammar school with the porter on the third deck. I don’t even want to think about Twitter and Facebook. The Food Network would be our only place of refuge. And all this leads me to wonder: are our lives improved by constant, overwhelming news reports? I realize that in a broad sense we are all part of the “human family” and sometimes news coverage gives us a better understanding of an issue or a situation. And certainly there is a human interest aspect to every major story. But so much excessive coverage also leads to stress. We can hardly breathe for all of the information that comes our way. The news channels seem less interested in providing us with the salient facts than in out pacing their competitors in the minutia race. The result is a LOT of “noise” and the inevitable annoying person at the office who has to be the resident expert on every breaking news story. Sometimes I think the generations before us had it better in this respect. They got the pertinent news, usually once a day, and unless it affected a friend or relative, they then went on about their business. Somewhere between 1912 and 2012 we’ve misplaced the happy medium. Oh, one other coincidence between the Titanic and the Sparrows: there has been many a “morning after” when someone in our family has suggested that they were hit by bad ice. The show begins. The entertainment was a husband-wife team in their 50s who had a Captain and Tennille sort of vibe, except he played the keyboard more like a deckhand than a captain and she, pardon the mixed metaphor, couldn’t carry Toni Tennille’s jock strap in a wet paper bag. I have no idea what that means. Their repertoire included mostly Snoop Dog and Lady Gaga stuff. Oops, sorry, that was the music I had running through my iPod during their performance. Just kidding, I don’t have any Snoop Dog. Actually they weren’t bad, as they succeeded in keeping the audience awake, no small task, and on numerous occasions even had them ‘gumming’ the words to some old familiar songs. The entertainment was really just the opening act for the main event – the crowning of the Merrill Gardens Valentines King and Queen. The room quieted as the hostess from ‘god’s waiting room’ came before the group to announce this year’s king and queen. In a very officious way she explained that the king and queen were voted on by the residents and that the results had been sealed since yesterday noon, probably in a prunes jar. She paused dramatically and explained that this year’s voting had a little twist – she would explain later. She announced the names of the king and queen. The new queen hurried to the front to be crowned and explained that the king was in the restroom at the moment and would be out when he was good and ready. The hostess then explained that the voting was so close this year that they decided to crown a runner-up king and queen, which was unprecedented. She then called out, “Jack and Barbara” – New Jack and mom! I leaned over and congratulated mom and whispered to her that as runner-up queen, should the 1st queen, for whatever reason, be unable to perform her queenly duties, that she would become queen! After the show, mom, New Jack and I retired to mom’s room. I knew my brother and sister were going to be asking a lot of questions about New Jack, so I needed to get some information out of this guy. With the help of some light water-boarding and a flood light, the grilling began. I learned that he was originally from West Virginia, but he seemed to have all his teeth and as far as I could tell did not play the banjo. He was a dentist for 30 years before moving to San Diego and getting into real estate where he apparently found that he could make more money with his hands in people’s pocket than he could with his hands in their mouths. He came to Sonoma because his only child, a daughter, lives there. The daughter has three grown children, the most interesting of which is a son who lives in Taiwan and works for the US government. New Jack thinks he’s a CIA spy of some kind; I think he’s a ping-pong table salesman. All and all, at the end of the interrogation, he seemed worthy of my mom’s attention. This budding romance is the talk of Merrill Gardens, but will it last? We don’t know whether to expect a call from ‘New Jack’ asking for our mother’s arthritic hand in marriage or a call from mom saying that the ‘Chicken Lady’ is now saving his seat. Time will tell. Post Script: I have poked some fun at the elderly here, but I poke fun at everyone and I just didn’t want to discriminate. Merrill Gardens does an excellent job of caring for their residents. Recently our mother moved into what was previously called an ‘old folks home’, but we have come to understand that that term is derogatory, insensitive and . . . well yes, politically incorrect. So we have created an ever-growing number of euphemisms to cover this concept, but for simplicity reasons we’ll just call it a ‘senior facility’ – sometimes the word ‘living’ is put between ‘senior’ and ‘facility’ I suppose to differentiate it from those ‘non-living senior facilities’. Our mom’s new facility is called Merrill Gardens and it’s located in the bucolic city of Sonoma – wine country, which often times comes in handy for those visiting our mother. It was her 93rd birthday and it was up to either one of my siblings or me to make the trip from Central California, Southern California or Scottsdale, Arizona to Sonoma to celebrate the occasion with her. My brother had just had a hip replaced, I’m assuming with another hip, so he couldn’t make the trip; my sister’s pancreas was not doing whatever pancreases are supposed to do, so she was out, and thus the familial obligation fell upon me. Road trip! The visit would not only provide me an opportunity to see how mom got nearly 55 years of crap from the last house she lived in, into a one-bedroom apartment, but more importantly it would be an chance to meet the new male ‘friend’ in her life that she had been telling us all about for the last several months. It was my job to ‘grill’ this guy and report back to my siblings regarding his intentions with our mother. Yes, apparently love has no age limit; love does however have a good sense of irony – mom’s ‘boyfriend’, as she calls him, is named Jack, which, coincidently, was what our father and her husband for 63+ years was named. ‘New Jack’, as we have affectionately dubbed him, is 87, which I suppose makes my mother a ‘cougar’ of sorts, but to her credit I’ve not heard her refer to him once as ‘boy toy’. We’re happy that mom has found someone; our father has been gone for over ten years now and mom was long-overdue as a hen in need of someone to peck. Those who have a parent in a ‘senior facility’ know that men are at a premium there, so she feels very lucky – I’m not saying she’s getting lucky, I’m just saying she’s feeling lucky – to have latched on to one. I met ‘New Jack’ in the lobby of Merrill Gardens as preparations were being made for their big, annual Valentine’s Day concert which included the ceremonial coronation of the ‘Merrill Garden’s Valentines King and Queen’. We arrived at the showroom (actually just some folding chairs set up in the lobby) early; as mom said it would get fairly crowded rather quickly. It did indeed become ‘walker room only’ thirty minutes before show time. Mom and I found three seats in the second to last row; we sat down and mom put her purse on the seat next to her, thus ‘saving’ the seat for ‘New Jack’ who had to go to the restroom . . . again. I suppose in some circumstances we still ‘save seats’, but I thought we stopped that practice after junior high, with the possible exception of calling ‘shotgun’ in high school, thus saving for oneself the most dangerous seat in the car. After that we just seemed to accept whatever seat we had and whoever sat next to us. But I’m here to tell you that we return to ‘seat saving’ in our golden years. The seat next to ‘New Jack’s’ saved seat was also vacant and being saved by the person in the adjacent seat. As the place was filling up, an elderly woman with a rather grumpy face, that we were to subsequently learn would match her personality, ambled down our row and tried to sit in ‘New Jack’s’ seat. My mother looked at her purse on the seat and then back to the elderly woman as if to say, “Are you blind, can’t you see my purse on the seat means it’s saved?” The fact that the elderly woman was indeed vision-impaired seemed not to matter, but watching this interaction, I learned something about getting older, and that is as we tend to rely more on communicating with a look rather than verbally, I assume this has something to do with the loss of hearing that typically accompanies old age. I digress; the elderly woman looked at mom as if she was a leper and started to sit down in the next seat over, when the woman next to that seat told her it was also being saved. The elderly ‘seat seeker’ then yelled for all to hear, “That’s ridiculous, they should outlaw seat saving!” and shuffled off in disgust. Seat savers, don’t be alarmed; while our representatives in Congress have passed sillier legislation, I don’t think the seat saving initiative is getting much traction. As we sat waiting for the show to begin, my mother gave me a running commentary on several of the passers-by. There was ‘Dog Lady’, thus labeled by my mother, not so much because she owned a dog, but because she looked like her dog, probably just in my mother’s eyes, as ‘Dog Lady’ had her eye on New Jack before “the new floozy (that’s mom) moved in’. Then there’s the ‘Chicken Lady’; no, not because she has or looks like a chicken, but because the wing in which she lives overlooks a chicken farm. Nothing too unusual there, except ‘Chicken Lady’ also had her eye on Jack (remember, I said men were a hot commodity in these facilities) and had a geographical advantage in that Jack lived in the same ‘chicken wing’. And trust me on this, proximity to target becomes more and more critical the less ambulatory one gets. Finally the show begins . . .